A park commemorates the bushfires which affected the Blue Mountains towns of Springwood, Winmalee, Yellow Rock, Mount Victoria, Mount Wilson and Mount Irvine in October 2013. 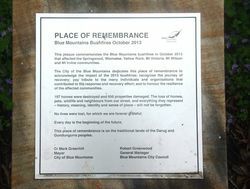 This plaque commemorates the Blue Mountains bushfires in October 2013 that affected the Springwood, Winmalee, Yellow Rock, Mt Victoria, Mt Wilson and Mt Irvine communities. The City of the Blue Mountains dedicates this place of remembrance to acknowledge the impact of the 2013 bushfires; recognise the journey of recovery; pay tribute to the many individuals and organisations that contributed to the response and recovery effort; and to honour the resilience of the affected communities. 197 homes were destroyed and 650 properties damaged. The loss of homes, pets, wildlife and neighbours from our street, and everything they represent - history, meaning, identity and sense of place - will not be forgotten. No lives were lost, for which we are forever grateful. Every day is the beginning of the future. 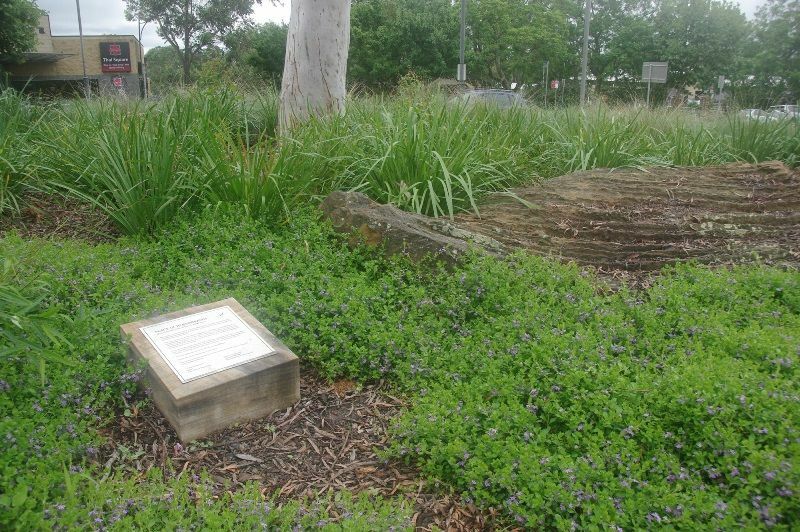 This place of remembrance is on the traditional lands of the Darug and Gundungurra peoples.